A big part of any IT support business is answering the phones and helping clients with the issues they are facing. But not just anyone is suited to this customer-centric position. In this article, we’ll explore these five central questions surrounding the work of a help desk technician. What is a Help Desk Technician? What is a Help Desk Technician Supposed to Do? When Should You Call a Help Desk Technician? How Should a Help Desk Technician Treat the Customer? Does a Help Desk Technician Have a Process? How does that process work? Everyone loves a little pat on the back now and then. Our help desk technician, Bryan, is no different. A few days ago, he helped a client by walking them through a sticky problem with their Office 365 software. In the end, the client was so pleased that he made a point of giving Bryan high praise in our call follow up email survey. 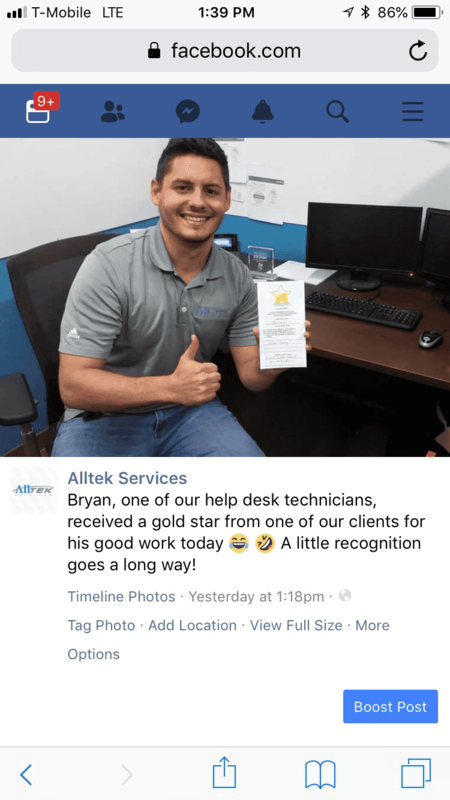 We’re proud of Bryan, and all our talented help desk technicians that work diligently each day to ensure that customers have answers to their technology questions and resolutions to their IT issues. After all, a big part of any IT support business is answering the phones and helping clients with the issues they are facing. But not just anyone is suited to this customer-centric position. Let’s take a few minutes and see what it takes to be a Gold Star help desk technician. Help desk technicians are the first point of contact for clients calling their IT support company asking for help, reporting an issue, or looking for answers and information. Help desk technicians are divided into “tiers” (Tier 1, Tier 2, Tier 3). Tier 1 technicians answer the simpler questions and perform the more mundane IT tasks such as password resets. From the Tier 1 technicians, IT issues, and more challenging questions get escalated up through Tier 2 and Tier 3 IT support. Generally, Tier 3 is reserved for the most highly trained or experienced IT support professional in the company. Everyone that has worked in customer service knows that there are always those few customers that call about every little issue and end up wasting the customer service agent’s time. On the other side of the coin are the people that spend hours of their own time trying to figure out the answer to their IT issue for themselves – even though they are paying for Help Desk services. Sometimes, it’s like walking a tightrope. Here are a few guidelines that will help you. Call your Help Desk when you find yourself in one of the following scenarios. The problem that you are experiencing is negatively impacting your productivity or efficiency. There may be a security-related issue of any kind. An answer to your question could save you significant time and resources. The issue persists following a shutdown and reboot of your computer. You have lost or are at risk of losing documents or data. Obvious signs of hardware failure (such as smoke, smell, or strange noise) are observed. Know the policies and Service Level Agreements that are in place and stick to them with gentle honesty. Most Help Desk services do have a process. It generally follows this pattern. Client calls, emails, or starts a live chat session. Technician asks the client to identify the problem. – What went wrong? Technician mentally determines the client’s technical know-how. – This is an important step because it helps the technician know how much the client will be able to assist in resolving the issue from their end. Technician checks past tickets to find out if this is a new or ongoing (chronic) issue that the client is facing. Technician begins to take notes. Technician escalates the help desk request at this point if the resolution is beyond the scope of his/her training or authority. Technician delivers the correct answer to the question at hand or clearly outlines the steps that will be taken next to remedy the situation. What was the client told? What steps does the client have to take to resolve the issue? What steps does the IT support team have to take to resolve the issue? When was the client told that the IT support team would follow up or give progress reports? Want to read more helpful articles from the Alltek team? We’ve got three here we think you’ll like!